Sunny Side Up in an Upside Down World: Girl's day!! I have always been a fan of the girl's day...or evening...or afternoon really. Just anytime ladies get together sans hubbies and kidlets. Especially if food is involved. :) Being a Navy spouse is difficult at times. We leave friends every few years and because most of them are also military spouses they are moving around so we know there is very little chance we will see each other again (thank heavens for email, Facebook, twitter, Instagram and Skype!!) But it is amazing how you can form quick, solid friendships with these Navy-attached women...because we're all in the same boat and we all know how important friendships are to help you feel grounded! 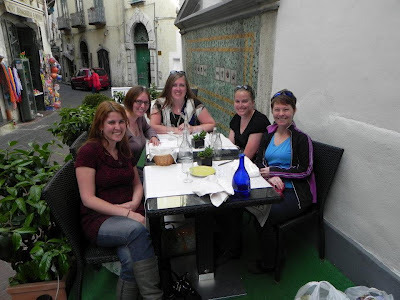 On April 2nd a few Navy Band wives spent the day in Vietri sul Mare...I'd been once already and knew it would be the perfect place for a day with the girls. 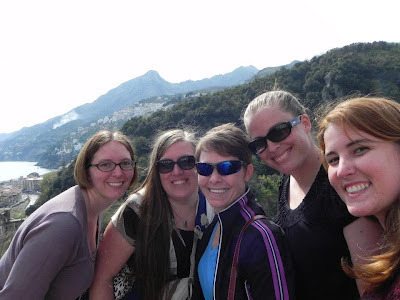 Meet my ladies: this is up in the little town center, the Amalfi Coast is what's behind us...pretty, eh? In Vietri, there are loads of ceramic shops. I'm guessing people throw their old/defective ceramics into the sea and that's how the beach gets covered with sea tile. It's similar to sea glass, it's just pieces of tile that have been washed and rubbed smooth. I collected more to add to my stash for the mosaic table top. Stephanie found quite a lot...but didn't bring a plastic bag to put it in...so she used the next best thing: her Dooney & Burke purse. Seriously. 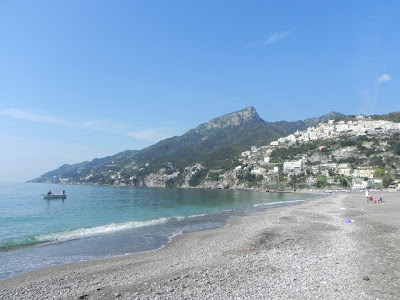 Here is the view from the beach looking back up to the town on the hill...the Amalfi coast is to the left. It's so pretty...I could stay here forever. 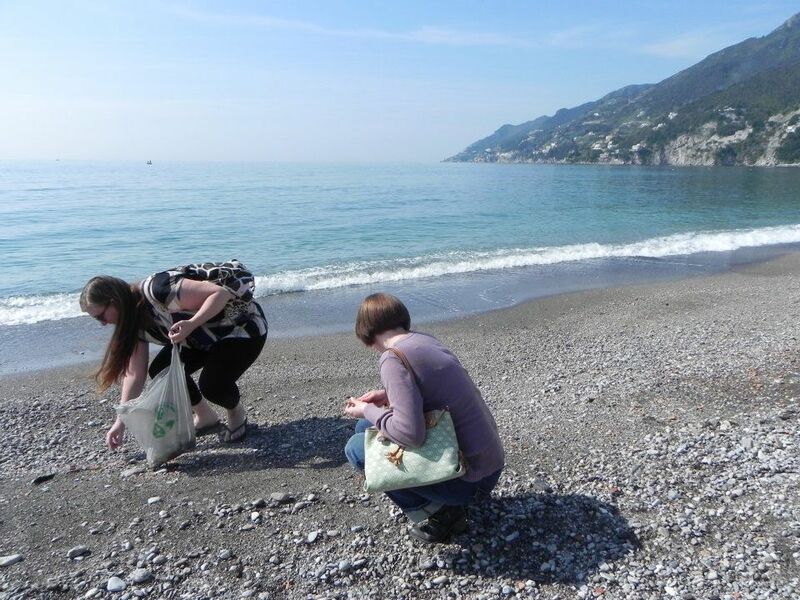 After beach combing we did a little economy stimulation...afterall we want to be good citizens of Italy! :) Here is Mel perusing one of the dozens of ceramic shops. A sign for Winston...it says 'beware of cat"
It looks gorgeous. You've made a group of good friends fast. I'm jealous of your ability to do so and your fearlessness at taking initiative. What a fun day!